Gereon Rios, the late painter, sculptor and art professor, has been honored by his children with the establishment of the Gereon Rios Memorial Scholarship Fund at Sonora Area Foundation. 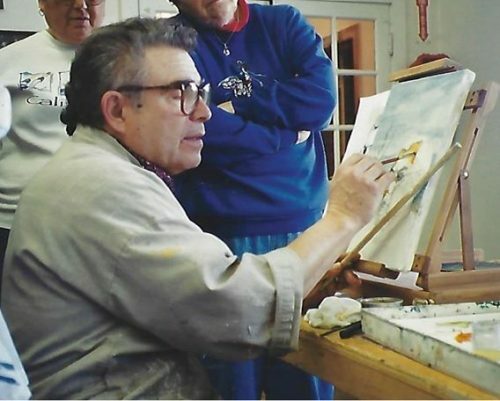 The fund, which grants scholarships to Sonora High School students pursuing art, is a fitting tribute to a man whose professional life was a blending of art and academia. Gereon’s family emigrated from Mexico to the United States when he was a young boy. Working in Central Valley fields, Gereon went to school only a few months out of the year when there were no crops to harvest. In his teenage years his family moved to Fremont, and Gereon turned his hand from picking to painting. At age 15 he opened a sign-art studio, beginning an artistic career that would span five decades. Two years later the Fremont city council recruited him to help create the city seal. Gereon enrolled in college and continued his career until war put both on hold several years later. In 1967 he began a two-year tour in Vietnam as an information specialist with the U.S. Army. He was awarded a Bronze Star Medal for his service – service which would inform his future art. After his tour, Gereon married and went back to college, taking advantage of the GI Bill to further his art education. He earned a bachelor’s degree from U.C., Berkeley, then a master’s degree from Mills College. In 1977 Gereon moved his growing family to Sonora and began teaching art at Columbia College. Two years later he established Sonora Academy of Fine Arts. He taught at both institutions until his retirement in 2011. 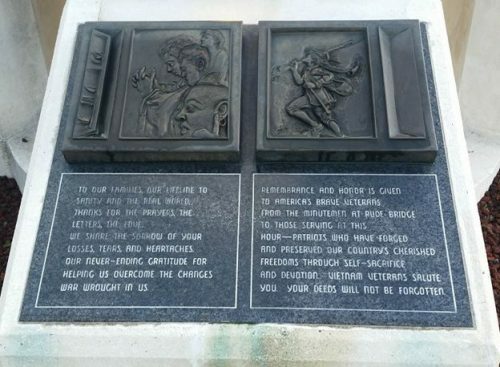 Gereon is perhaps best known for two public sculptures in Sonora: the bronze Vietnam veterans memorial at the Tuolumne County Library’s main branch and the veterans memorial at the U.S. Department of Veterans Affairs clinic. These pieces and others reflect a theme that was often at the heart of his art: individual sacrifice for the benefit of others. Gereon’s art also reflected compassion for the less fortunate. Around the time of his retirement he prepared an exhibition of his work he titled “We the Beggars,” comprised of two- and three-dimensional artwork and performances that were designed to show “the general public and the world that we must take care of our fellow human beings,” he wrote. Gereon passed away on April 23, 2018. Creating a scholarship fund to honor their father, an artist with a passion for higher education, was a natural choice for Eon and his brothers Temoc and Andro Rios. All three brothers excelled academically, earning advanced degrees and going on to careers in medicine, engineering and research, respectively. This newly established fund bridges that gap, giving talented youth the opportunity to carry their artistic dreams into their academic futures.